Tracing the history of a house or building can be difficult in St. Louis Park, since the highways, streets, and addresses were all in a state of flux. The following are just some examples of the changes made along the way. Please contact us if you have any insights or stories. The St. Louis Park Herald was a short-lived newspaper that lasted only six months in the year 1915, but it yields a tremendous amount of information about Park at its infancy and the predictions people had for the Village’s future. One such visionary was Herbert Carleton, who opined in the paper often about the nuts and bolts of real estate (his business), streets, commerce, and transportation. Carleton wrote the following over 100 years ago, advocating two “arterial highways” that would avoid at-grade intersections with the railroads – was he right? St. Louis Park is now in condition to foresee a great future and to see where arterial streets should be laid out. Our railroad center is bound to become a great business center and for its future greatness, streets should lead from it to all parts of the village. Our streets should so run that trade would be brought through or to our village instead of past it into Minneapolis. Lake Street, Pleasant Ave. [Wooddale], and Falvey [Louisiana] Ave. are streets that will care for much business some day. Main Street [Dakota] might become one were the Village Council to order the Railroads where they cross it to provide a bridge and then the street on the south side of the railroads were it laid out so as to meet Pomona [Yosemite] Ave. at Excelsior Ave., a direct route free from railroad crossings would be provided, nearly all the necessary land would be donated and but a few lots would have to be bought and the cost of this should be placed on the other lots greatly benefited. Were Broadway [Walker] and Chesley Ave. [35th Street], merged at Earl St. [Zarthan] and put under the railroads at railroad expense largely and thence extend over Highland Ave. [36th Street] to Excelsior Ave., not only would we have an arterial highway to the east, free from a grade crossing but a surface drain for water would be provided that would care for a large extent of land and as nature intended it should be. Alas, it was only many decades later that overpasses and underpasses were and continue to be constructed, and the railroads leave very few routes to travel through the city. On May 4, 1934, the numbers of all state highways changed, creating some present-day confusion when reading old maps. Nearly 40,000 signs were changed in less than a day. For example, when it was first built through Hopkins, Highway 7 was known as Highway 12. Likewise, Superior Blvd., which had been renamed Wayzata Blvd. at the request of the Mayor of Wayzata, was known as Highway 10 before it was changed to Highway 12. The section of present day Highway 100 south of Excelsior Blvd. was at times known as Highway 5, 169, and sometimes concurrently 169 and 212. Highway 169, on our western border, was first Jordan Ave., then County Road 18. All the streets of our village have official names. Some streets have several such names legally adopted. There are three Main streets and three Summit avenues, each in a separate part of the village and having [no] future possibility of ever merging. We who live here may not need street names to describe our homes. But more and more our friends and business acquaintances need them to find us. A correct street name may prove very misleading to a stranger who consults an official plat. I would like to suggest that our Village Council provide street signs wherever petitioners are willing to put up the cost. In this way a large number of signs of a uniform style would mark many important streets. But along with this should come an ordinance providing that but one name should appear on any one street and that no new streets should hereafter be laid out with names duplicating names of streets already platted in our village. Sounds reasonable enough, right? Well, Mr. Carleton wrote that in September 1915, and the Village Council took his advice – 18 years later. On August 16, 1933, the St. Louis Park Village Council passed Ordinance 71 changing the street names to conform to Minneapolis’s numbering, avoid names already extant in Minneapolis or St. Paul, eliminate the confusion of streets with several names, and several streets with the same name. 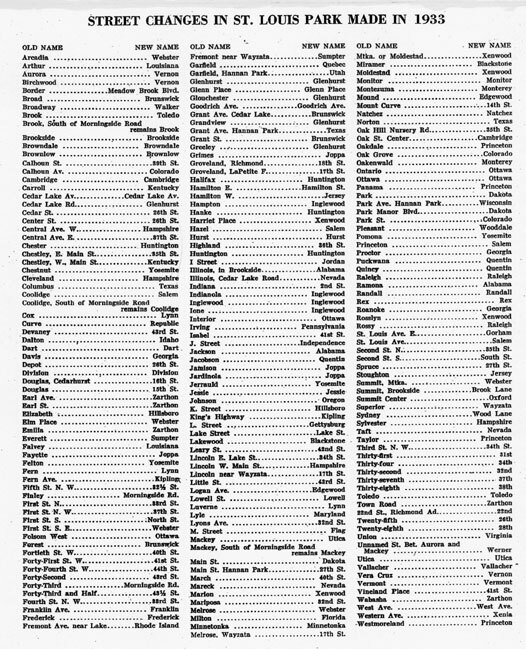 The list of old and new names shows that in the past, some effort must have been made to impose an order, as there are First through Fifth Streets and some streets with just a letter, but it was quite a jumble. A committee made up of Carroll Hurd, Edward Ludwig, and Mayor Kleve J. Flakne (assisted by Lydia Rogers), came up with new names for existing streets – “A Herculean task,” according to Hurd. The ordinance alphabetized the street names to make them easier to find. The First Alphabet started at France Avenue and continued down. What’s curious is that the first few streets were already in alphabetical order but were changed anyway. There doesn’t seem to be any pattern or theme to those names (but see Joppa and Zarthan below). Moving west, the Second Alphabet was named after state and Canadian province names. The Third Alphabet had to be historic or patriotic. Later streets could be named by the developers, as long as they conformed to the established guidelines. The change was effective on August 24, 1933. The first St. Louis Park Directory and Street Guide was published (1933-34), with each address given with the old and new street names. The “alphabet streets” are also coded by a block number which indicates the number of blocks west it is from Nicollet Avenue. For example, France is 39 blocks from Nicollet Ave. and is thus the 3900 block in St. Louis Park. We have compiled a list of block numbers for each “alphabet street” for your reference. There were many street name changes through the years, especially during the 1950s building boom. Here are the ones that we know of. Our thanks to Mayor Flakne’s son Gary for providing some of the explanations. At the request of Beth El Synagogue, 25 1/2 Street West, which is located between the synagogue and Benilde-St. Margaret’s, was renamed Barry Street West, in honor of donors Charles and Melanie Barry (namesakes of the Barry Family Campus at the Sabes Jewish Community Center). The change was approved by the City Council on September 4, 2012. 35th Street was originally Chesley Ave., named after Joseph Hamilton’s son. 35 ½ Street started out as St. Louis Avenue until Ordinance 683 changed it in 1960. 39th Street was originally 39 1/2 Street until it was changed by Ordinance 695 on May 25, 1959. 42nd Street east of Highway 100 was labeled 43rd Street on the 1941 map. Then trouble began – for nobody could seem to find Littel street. So the people who lived on Littel – sometimes still called 43rd – went to the council last August for help. And this is the solution the councilmen came up with: “We won’t call it Littel, but then we won’t call it 43rd either. Instead let’s rename it 42 1/2 street.” And they did. Aquila was named by Mrs. Marlys Westling when she and her husband subdivided their property north of Minnetonka Blvd. She originally wanted to name it Aragon, but it was deemed too close to Oregon. Then she found a book called Action at Aquila, which described a Civil War battle where eight men were killed. The 1938 novel was written by Hervey Allen (who also wrote Anthony Adverse in 1933, which Warner Bros. made into a major motion picture in 1936, starring Fredric March, Olivia de Havilland, Claude Rains, and Gale Sondergard, and directed by Mervyn LeRoy). Beltline Blvd. was named in 1968. Boone was also named by Mrs. Westling (see Aquila). This street was named in honor of Mrs. Westling’s shirt-tail relative, Daniel Boone. She said she had to show the Village evidence of a battle named Boone to get it approved. Burd Place would normally be Wyoming Ave. in the scheme of things, but neighbors petitioned to keep the name. The Burd family built their house on the street in 1922. The story goes that Mrs. Burd got lonely living so far out in the country so her husband had other houses built nearby so she would have company. There is still a barn in the back of the original Burd house. Browndale Ave. was built by Edina farmer Henry Brown for the use of pioneers coming from Lake Minnetonka to his flour mill. The avenue was planted with elm trees that created a canopy of leaves, inspiring the name Lovers Lane. It ran straight south starting from Wooddale (between 41st and 42nd) parallel to the creek in Edina, and ended at the mill. A Mr. King reported that Browndale Ave. had been opened for traffic between 44th St. and Wooddale in September 1917. Dart Ave. is a one-block street between Morningside Road and 44th Street just north of the Edina border. It was named for George B. Dartt, a very successful Minneapolis real estate man. He sold lots and lived in the Browndale Park addition, building one of the first homes there at 4500 W. 44th Street in 1910. Interestingly, the 1933 map that came with Park’s first directory listed the street as Dart (as it is today) in the index but Dartt on the map. Edgebrook was once South Street (still parallel to North Street). Edgewood was improvised when there weren’t any states or provinces starting with the letter E.
Excelsior Blvd. was first known as Territorial Road #3, then County Road #3, Excelsior Road, Excelsior Street, Excelsior Avenue, and finally Excelsior Blvd. In the 20th Century, it changed from Excelsior Blvd. to Excelsior Ave. once it crossed the border into Hopkins. Factory Street was supposedly the address of Monitor Drill, but the name does not show up on the old or new sections of the 1933 list. There is a Monitor Street (see below). There were two early landowners named Goodrich, George and Calvin. Goodrich Ave. was named for Calvin, who, along with Alvin Truesdale and their wives, platted St. Louis Park Centre in 1887. George Goodrich owned the land that became the Lenox neighborhood. Gorham Ave. is located in the industrial area of St. Louis Park. Its original name was St. Louis Ave. E. The new name was undoubtedly named after Lewis R. Gorham, a schoolmate of T.B. Walker who was hired to buy and take options on farmland in St. Louis Park in order to have it replatted into Walker’s dream industrial city. Gorham’s name comes up as the manager of the Walker Building when the Commercial Club minutes of July 1917 indicates that Mr. Gorham refused to put in heat or toilets in the upstairs of the building. Hamilton Street was named after village founder Joseph Hamilton. Hillsboro had been previously named and was a short street, so the name was not changed in 1933. Joppa is a Biblical name of a city in Israel, and has to do with Mayor Flakne’s Masonic Lodge, according to son Gary. Jordan was actually the last street in the Village; it has since become Highway 18 and now Highway 169. Louisiana Ave. was originally Falvey, named after a prominent pioneer family. Mackey Ave. is one of a series of streets that veer off the naming grid on southern border of Edina. North of Morningside Road, the street was changed to Utica in 1933, but to the south and into Edina to 44th Street continued to be called Mackey. Frank J. and Florence Mackey bought part of Henry Brown’s “Browndale Farm” in 1909. They filed the plat of Browndale Park that November. This 150-lot addition includes homes on Morningside, 44th, Wooddale, Browndale, Mackey, Brook, Coolidge, Dart, and Glen Place. It was then that the eastern edge of Aurora Ave. (100) was first laid out, originally planned to be 20 ft. wide but changed to 30’ ft. at the request of the St. Louis Park Village Council. Many of the lots were 75 ft. wide. Newspaper files reveal that Mrs. Mackey was well known as a stylish lady in Minneapolis. An article in the Minneapolis Tribune dated November 3, 1906 called her the most interesting visitor at the Chicago horse show. Her gown and hat were described in detail. At the time she apparently lived in London. Another article from the same paper dated February 6, 1910, indicated that Mrs. Mackey had taken a townhouse in Grosvenor Square, London (no mention of Mr. Mackey). Frank Mackey was a widower by 1914. Monitor Street was named for the Monitor Drill Co. It is now a short street behind Sam’s Club. Monterey Drive was named in 1967, replacing part of 36th Street. Park Place Boulevard was carved out of a section of Vernon Ave. north of Cedar Lake Road on February 4, 1993. Texas Circle had been 16th Court until 1961. Vernon Ave. between 26th Street and Highway 12 was built in about 1960. It became Park Place Blvd. on February 4, 1993. Walker Street (formerly Broadway and originally planned to be Park’s main commercial street) was named after T.B. Walker. Wayzata Blvd. : On November 4, 1931, the Village Council approved the request of Rufus R. Rand, Mayor of Wayzata, to change the name of Superior Blvd. to Wayzata Blvd. A Minneapolis councilman reported that Wayzata means “North of the Pines.” Rand reasoned that the name Superior was misleading, in that it did not go anywhere near the city of Superior. Westmoreland: In 1959, it was proposed to change 36 ½ Street to Westmoreland Street, but it was defeated. Westmoreland was the name of the subdivision that would eventually become the site of the Rec Center. It had been platted out into lots, but the city bought them out one by one. A 1964 map shows the area as a city park called Westmoreland Park. The only vestige of the old name is that of a condominium complex in the area. Meanwhile, way across town, a Westmoreland Lane shows up by the Westwood Hills Nature Center. It is not consistent with the Third Alphabet – where did this name come from? Westside Drive was originally Stephens Drive, reflecting the change from Win Stephens Buick to Westside Volkswagen. Wooddale Ave. has had many names over the years. It is generally believed that it was called Schoolhouse Road when Jonathan T. Grimes first laid out the road so that his children (who lived nearby in Edina) could attend Pratt School. An 1891 map calls it Glencoe Road, but this is confusing, since Excelsior Blvd. is frequently labeled Glencoe Road as well. A map from 1914 indicates that the road is called Pleasant Ave., formerly called Garfield. The name was changed to Wooddale in 1933. Zarthan, like Joppa, was a Biblical name and had something to do with Mayor Flakne’s Masonic ties, according to his son. On the 1933 list it is spelled Zarthon.